I know that within my own lifetime, food has gone from being a good thing that people generally like and are happy to have around to being SUPER TRENDY. I don’t know who first coined the term “foodie” or published the first food blog, but at this point, everyone knows that food is cool. The icing on the food cake for me was probably the way that Pinterest suddenly made all these foodie websites so available. The result: there are so many amazing food blogs that I’m subscribing to that I can barely keep up with all of them, and I keep discovering new ones that I want to follow! This post is my attempt to reproduce a recipe published by Whole Living Lauren. 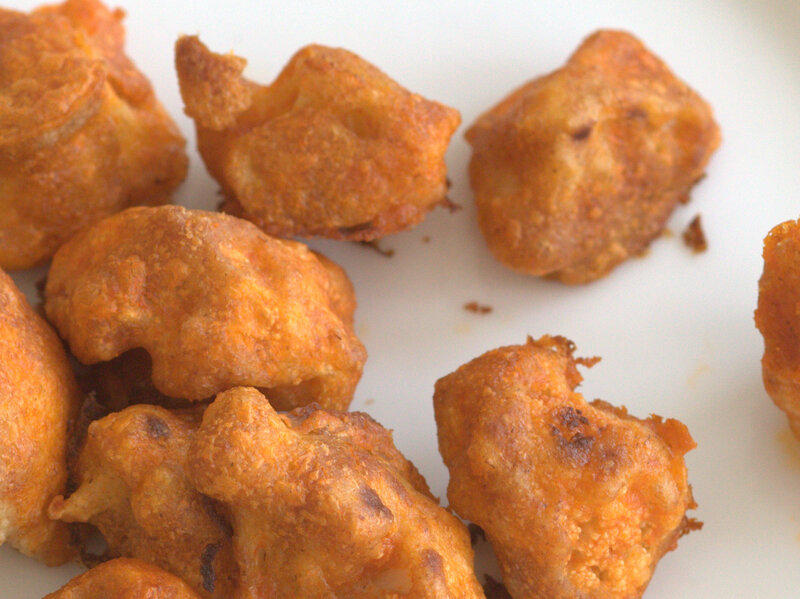 Buffalo Cauliflower Bites! I started following Lauren’s blog because a friend of a friend of hers was helping to get the word out and sent me a link to it because they knew I’d be interested. She posts plant-based recipes that are always really healthy, and everything I’ve made from her blog has been delicious! Speaking of food trends, what’s more in vogue than cauliflower? Since cauliflower basically tastes like absolutely nothing at all, people seem to be finding ways to sneak it into everything and make it a substitute for virtually anything. In most cases, cauliflower replaces something decidedly less virtuous. In this spirit, the internet has delivered to us such delicacies as Cauliflower Pizza Crust, Cauliflower Rice, and even…. Cauliflower Steaks?? 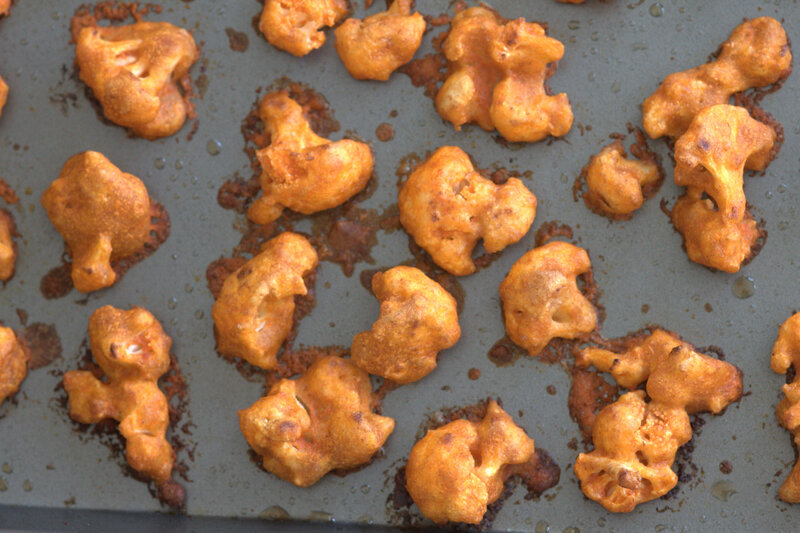 These Buffalo Cauliflower Bites are slightly battered and then baked until they’re crispy. Then they get dunked in a hot sauce and butter mixture and baked again to keep the crisping process going. 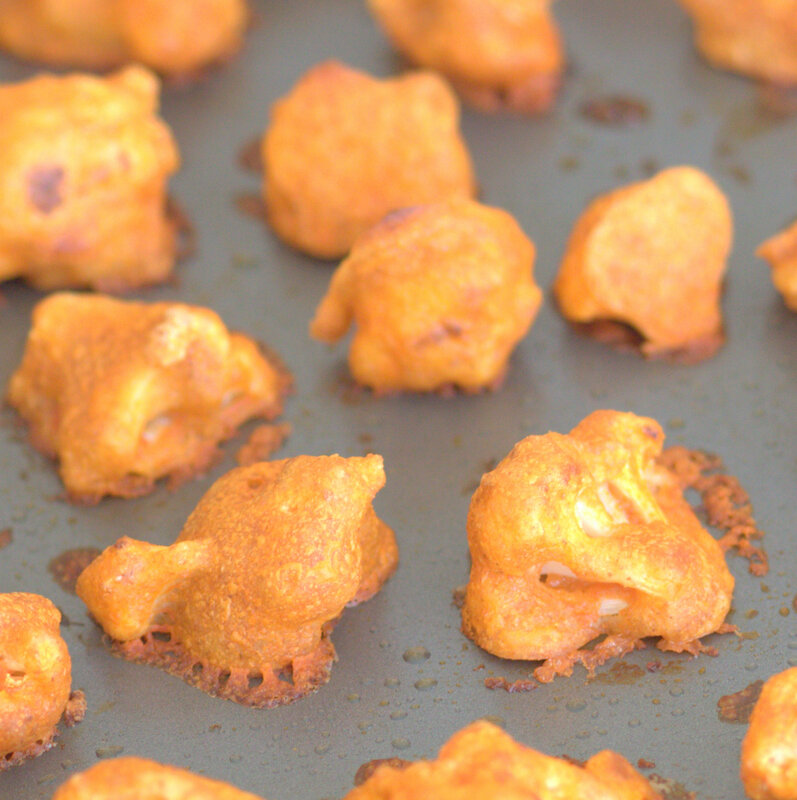 These are so delicious that after making a whole baking sheet full of them, I basically stand over the stove shoveling them into my mouth until there’s almost nothing left to plate. Seriously addicting. 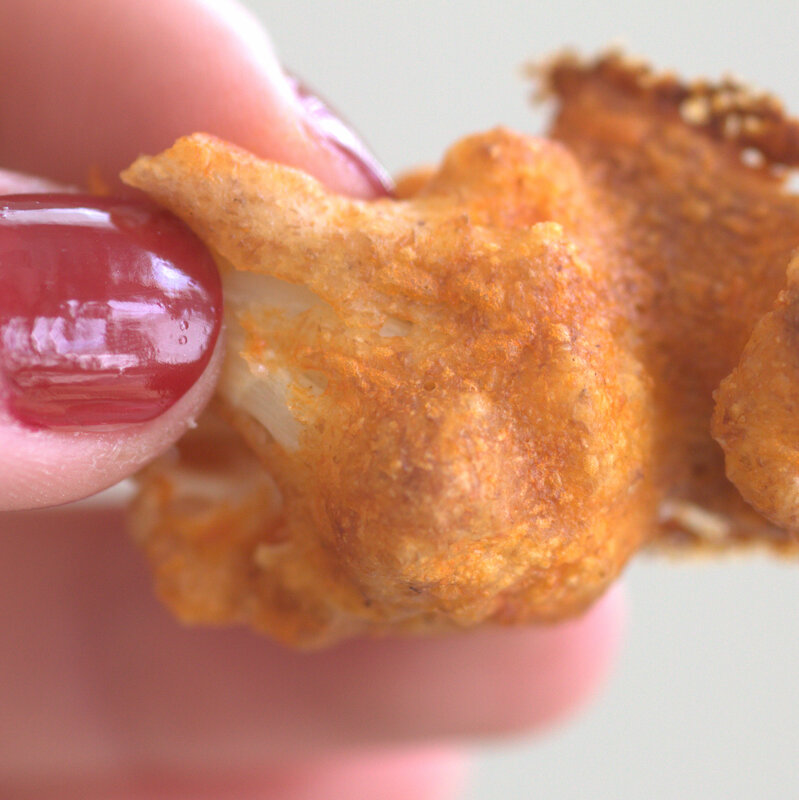 Crispy, spicy, warm, and chewy. That’s how I want to eat my vegetables, thank you very much. 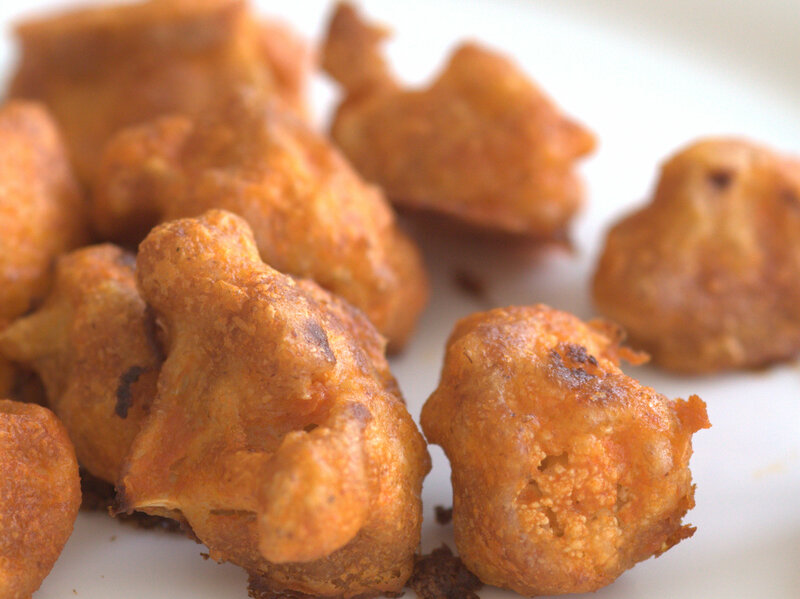 You can find the recipe at Whole Living Lauren’s Buffalo Cauliflower Bites. Enjoy!! Sounds awesome! Got to try this one. They are – I swear I’m not even lying! Did you know that Alyssa went to high school with her? These do sound good with a slightly different seasoning on them. Not going to do buffalo seasoning!